Farther still to the left, in the south corner of the room, towers an abundantly decorated Christmas tree. Ribbons and leafy purple flowers adorn the artificial green branches, which are bedecked with such ornaments as teddy bears, a Santa and even a Mark McGwire swinging a baseball bat. Atop the tree is another angel, wearing white feathery wings and a flowing maroon dress as she looks down upon the Figure. All quite lovely and uniquely crafted, yet none of them can match the poignantly beautiful artistry of the figure: Mary, the Blessed Mother, cradling the lifeless body of her crucified son on her lap. In this Christmas season, the Pieta appears incongruous, perhaps even inappropriate. The Virgin and our Savior are all white and rest on a mostly black marble base. The figure measures 6½ inches tall, 5¼ inches wide and 3¼ inches deep — much smaller than Michelangelo’s actual sculpture of 5-foot-9 tall and 6-foot-5 wide. That original, full-sized blue-grey marble statue, completed near the end of the 15th century, graces St. Peter’s Basilica in Vatican City. Though fairly illiterate about art, I never will forget the moment I initially encountered it during my 1983 trip to Rome. I was 20 years old. Exuberant and emotional about my newly deepening faith, I walked unsuspectingly into the basilica’s first chapel on the right and felt as if struck by lightning. 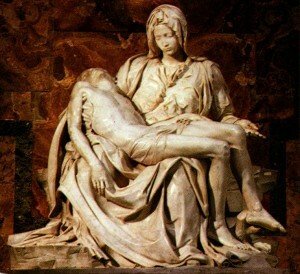 I had heard of Michelangelo; I had seen pictures of the sculpture; I even knew it was called the Pieta. I didn’t know exactly what Pieta meant. I didn’t need to know. I could see it for myself. I could feel it overwhelm me. Michelangelo’s Mary, her head bowed over her son’s limp torso, exudes mercy for humanity as she gently holds up His left leg with her left hand. Hers were the same arms and the same lap that had held the Word Made Flesh a few decades earlier in a Bethlehem stable. O, dear Mother, surely you didn’t imagine this ending to the story when first you pondered God’s plan in your heart. As you mourn your son’s death, do you recall your confused thoughts when the angel announced the miracle of conceiving by the Holy Spirit? Do you remember the joy of His birth, the hope that filled the world? God’s promised mercy still unfolding. The corpse of Michelangelo’s Christ, just lowered from the shameful cross, is covered by even less than the swaddling clothes in which Mary wrapped Him as a newborn miracle. Almost every one of His ribs on the right side of His body are visible. His right arm is hanging down against the front of his Blessed Mother’s gown. His head lies back, not a breath remaining, a sign of the Divine Mercy the Father had intended all along, even on that most silent, holy night. My sweet Lord, you are love made man. You are heavenly mercy incarnate. What began with so much promise of peace, rejoicing angels — why did your mercy have to take this detour? As I am engulfed by the festivities and celebrations reminiscing about your innocent birth, grant me the blessing of living in the wisdom that began on a calm, bright night yet had to involve suffering and pain. The Christmas decor of my living room might appear unsuitable for the figure of the Pieta. But as we learn to receive and practice mercy in our lives during the coming year, consider that we likely should embrace both the manger and the Pieta.